Located in the quiet Beverly community, this location is ideal for professionals and families alike! Easy access to the Downtown Core and major commuting routes including the Yellowhead Highway and 118 Avenue, plus plenty of transit options nearby! The neighbourhood is dotted with parks and schools, including R.J. Scott, Lawton and Abbott and even offers easy access to Rundle Park and the famously beautiful Edmonton Rivervalley. Not to mention, Walmart, No Frills, Shoppers Drug Mart and more retail and restaurants amenities are just blocks away! You'll truly fall in love with this neighbourhood! The building is home to townhouse style units, each with their own utilities and entrances. Inside the units you will find modern finishings and tons of natural light, along with great layouts and plenty of space. 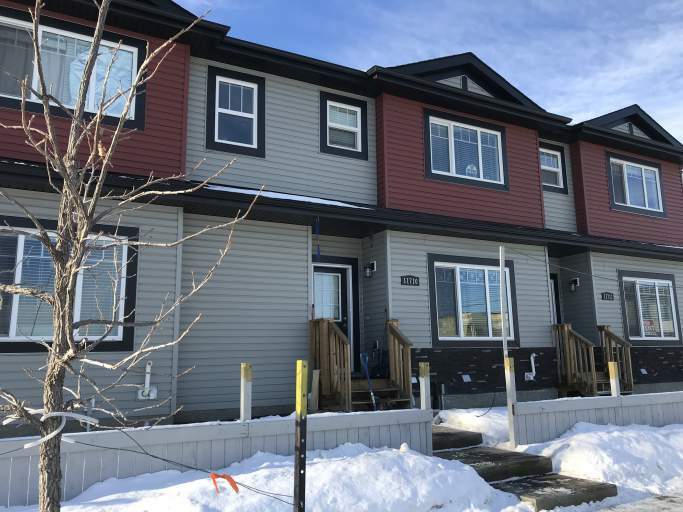 Walk inside the front door and you will be greeted with an open concept layout offers a large front living room with stylish dark flooring, a modern kitchen, a dining area along with a half bathroom. The kitchen boasts stainless steel appliances including a full-size fridge, stove, microwave and even dishwasher! These appliances are paired perfectly with beautiful white cabinetry and matching tile backsplash! The functional layout and amazing kitchen will make entertaining a breeze! The upper level offers a large master bedroom with modern flooring and its own private full bathroom along with two additional spare bedrooms and another full bathroom. The basement level is unfinished, perfect for extra storage or a play room, and home to laundry machines! All exterior maintenance and snow removal is included, no need to worry about shoveling! !